Based at UCL since completing postgraduate work at the University of Birmingham. My research was then on industrial location and regional development in Britain. From the 1980s, however, it focused on the implications of the growth of producer and business services for modern regional restructuring. 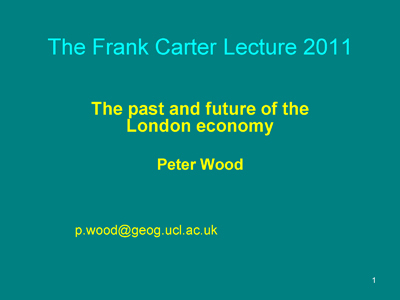 I formally retired in 2005, but remain active in research, conference attendance and writing, in collaboration with economic geographers and others at UCL and elsewhere. I taught economic geography, regional development, London , research methods and latterly, 'Services and Regional Development'. Visiting professor at University of Lund (Sweden), University of Waterloo , Ontario , Canada, University of Minnesota / Macalester College, U.S.A., and in 2010 at the Norwegian School of Management BI, Oslo. Head of the UCL Geography Department from 1997 until 2002. Other past roles include UCL Schools Liaison Officer, membership of many College and university committees, and Geography undergraduate and admissions tutors. Vice-Chair and Final Assessor, Chartered Geography Scheme, Royal Geographical Society (with IBG), 2002-14. Honorary Fellow, Royal Geographical Society (with IBG), 2015. Hon. Secretary, Council for British Geography (COBRIG), 2000-2016. Chair The Frederick Soddy Trust. Fortunately, I do not have to be on committees any more. Past member of the UCL Council, Academic Board, Social and Historical Sciences Faculty Board and many other committees. Head of UCL Geography Department from 1997-2002 and in 2002-3 convenor of UCL Geography's Centenary celebration events. Co-Chair of the Royal Geographical Society-Institute of British Geographers Chartered Geographers Assessors’ Panel. Hon. Secretary, Council for British Geography. Postgraduate: Contributions to research seminars. Consultant, ‘State of the Cities Report’. Project on ‘Innovativeness and Creativity in London’ for ODPM-sponsored project. Consultant, 'University-related companies in science, engineering and the creative arts among 13 Higher Education Institutions in London' (with Lawton Smith, H, Chapman, D, Reid, P, Barnes, T and Romerio, S) Report to London Higher, March 2007. Consultant on ‘International Corporate Mobility: Return Survey on effects of recession’, (with J. Salt). Leverhulme Trust. Consultant, ‘Satisfying Labour Demand through Migration’, Report to the Home Office (SRG/10/013) for the European Migration Network. (with Salt, J, Mateos, P, Dobson, J, Latham, A, and others)., March 2011. I am interested in the role of business services in providing technical and managerial expertise, especially in relation to the capabilities of client organisations. The rapid growth of consultancies reflects wider restructuring processes in globalizing economic conditions, affecting the accessibility of places to technological and other commercially significant skills. My work in the 1990s revolved around four collaborative projects funded by the UK Economic and Social Research Council and the European Commission. These included investigations into the development of small business service companies in SE and NW England (with D Keeble and J Bryson); the regional impacts of the use of consultancies by large clients; the regional conditions influencing foreign markets entry and development by business service companies (with P. O'Farrell); and the impacts of growing consultancies use for innovation in Europe (with teams from 8 other EU countries). More recent work has included studies of the innovative basis of UK and other European cities, especially the role of the 'knowledge intensive business services'; the prospects for inner city enterprise in London (for the London Borough of Camden); the range of entrepreneurial 'spin-off' from universities in London (with H. Lawton-Smith); international movement of expert staff by multinational companies, including consultancies (with J. Salt). MJ Taylor, 1970: Spatial linkage and the West Midlands Iron Foundry Industry. KC Liang, 1972: Kowloon : a factorial study of urban land use and retail structure. R Auty, 1973: Scale economies and plant location in Caribbean Sugar industry. DJ North, 1974: Location change in the development of the firm: a study of the UK plastics industry since 1960. RF Tomlinson, 1974: The development of a Geographical Information System: the Case of the Canada Geographic Information System. KC Tan, 1979: Constrained control of spatial systems: an application to the allocation of the rate support grant. AC McKinnon, 1984: The Spatial organisation of physical distribution in the food industry. T Herrshchel, 1993: Economic restructuring and local policies in the 1980s: A comparative study of England and Germany . Richard Goodall, 2002: Charity shops: Organisation, representation and retailing in the voluntary sector.